I’ve planned it all out. I will live to be at least 100. There is longevity in my family. I am thin, I eat excruciatingly healthy meals, and I do yoga. Why wouldn’t that be the case? That would give me another 50 years to figure out what I want to be when I grow up. Sure, it might get lonely. Statistics are quite certain that I will outlive my husband. I figure I’ll go live on an ashram when I am old and widowed. It has to be better than a nursing home. I have plans to help my children with their children. My parents couldn’t, didn’t help me. I am determined to help my children. There is a lot that I want to do with my next 50 years. Every now and then, though, I am shocked into the realization that my life could end at any moment. That was my phone call to my husband on Monday after I heard the news about the bombs in Boston. That feeling was back. After September 11, every good-bye became imbued with meaning and emotion. I made a point to look in my loved ones eyes, to hug them, to tell them I love them. I closed my eyes in the Grand Central tunnel. I … prayed … that my commute, that my daily ordinary life, would not kill me or anyone else. After all, you never know. Of course, over a decade later, I relaxed. A little bit. Now, it’s back. Coincidentally, my daughter and I had finally planned our first trip to look at colleges. In Boston. This week. No more procrastination. Winter Break in Stowe is behind us. Spring Break in Spain is behind her. My first 100 days on my new job is behind me. No more denial. She is 17 and leaving home in 16 months. It’s time. Where to look? Eastern corridor. D.C., Philadelphia, Boston. She has loved Boston since her first school trip there in 7th grade. Boston it is. We made the reservations. 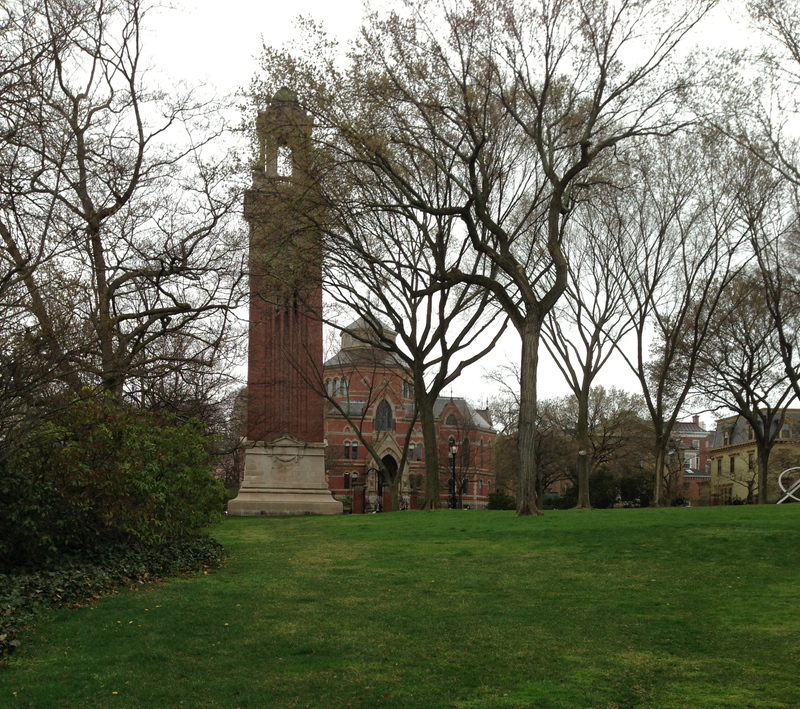 Tufts – a beautiful campus school. MIT – she is an engineering nerd like her father (and just a regular nerd like her mother). BU – what about an urban experience? Instead of anxiety, I started getting excited. There is perhaps no more exciting life transition than going to college. Instead of focusing on how much I am going to miss her and worry about her, I started focusing on what she must be experiencing. What a thrill! After the bombs on Monday, we discussed rescheduling the trip. Our schedules are so tight; our excitement so high; we rationalized that Boston is as safe a place as any. Boston it is. We packed Thursday night and went to bed, ready to leave before dawn in order to make our 10am info session at BU. They warned that parking was terrible, so we needed plenty of time. In the car, fortified with Starbucks before 6 am, we were off. Dark and quiet, the magic I had hoped for happened. No radio, no tv, no computer, no cell phone, we talked. And talked and talked and talked. What kind of school would be a supportive and nurturing environment for my beloved first born? Where might she be happy? Where might she want to live? What might she want to do? How to reconcile her math/science head with her intensely creative and talented art ability? And, not to spoil the dreaming, what could we afford? We couldn’t afford any of the schools we were looking at. We just have to start somewhere. No, we were obliviously and happily in our magical mother-daughter world. It took a while for the news to sink in. Boston was locked down. Everything was closed. A manhunt was on. There was a shooting at MIT, precisely where we here headed that afternoon. This was not a movie, this was real life. WTF?! WTF?! WTF?! I pulled off the road to consider our options. My first instinct was denial. They’ll catch him and everything will be fine. Let’s keep going. Ridiculous. And she was scared. My second instinct was panic. Let’s go home. But we were so psyched to look at schools and have this special trip together! I breathed. I calmed down. I decided to exercise my live-in-the-moment flexibility muscle. You know, the one that is not very strong because I am a controlling, rigid, organized, disciplined, set-in-my ways, always-in-motion, nut. What else could we do? Aren’t there other schools we could look at? Well, we’re right near Rhode Island. Some good schools there. Providence is a nice town. Newport is a nice town. We set the GPS for the University of Rhode Island arriving, magically, at 10am just as an Information Session and Campus Tour was about to begin. They welcomed us heartily and off we went on our very first tour. There was a lot to like, though it didn’t inspire that Aha! thrill of an ivy quad that she is waiting for. She raised her eyebrows at me when we looked at the dorm room for three. I teased her, reminding her that she had once dreamed of bringing her beautiful Queen bed to college with her. And where would all her clothes go? I reassured her that she could store off-season clothes at home, requiring regular visits home to update her wardrobe. Phew, that problem was solved. The day was looking up. We jaunted off to Newport for lunch having the most delicious tuna I have ever ever had at Diego’s (truly, it is amazing and worth the trip) and topping it off with the best chocolate – ever – at Destination Chocolate (truly, it is amazing and worth the trip). We fantasized about the sailboat my husband wants. She and my husband had the same thought at the same time. As he texted, she spoke out loud: “If I go to URI, Daddy will want to get a boat and keep it at Newport!” They are DNA twins. We drove past the Newport mansions, anticipating the movie release of Gatsby. I hope it’s good. Maybe I should read the book. She read it for school this year, but I never have. Off to Providence. Brown didn’t have any tours this weekend, but we figured we could just walk around and have our mother-daughter hotel night there. We drove into town. What a manageable city! We headed toward Brown. You drive up “College Hill” and it hits you. Beautiful, understated, old, ivy academic richness. It was what she was waiting for. She fell in love. Even if she’s one of the 6% or 9% or some silly low percentage that gets accepted, we can’t afford it. Back at our hotel, I found it hard to tame my urge to be in anxious and perpetual motion to DO SOMETHING. Movie? Providence Bruins game? Restaurant? I was ready! She confided, “Mom, could we get room service? I’ve always wanted to get room service. Maybe we could just hang here and watch a movie on the tv.” Gulp, how unaspiring. OK. Gulp. We can do that. Gulp. We looked at the room service menu. Hamburgers struck us as a decadent choice. Especially for me, the excruciatingly healthy sometimes meatless one. Gulp. We ordered hamburgers. She picked the movie, Pitch Perfect. I would have picked some Oscar nominee that I hadn’t seen. It was such a fun movie. We ate our delicious hamburgers. We ate our delicious chocolate. We laughed at our fun movie. It was the best night – just about ever. Safe as anyone can be, blessed to have such a special chance for mother-daughter time, I enjoyed just being with her. The movie ended. We checked the news from our haven and were beyond relieved to see that the manhunt was over. The next day, I continued (or tried) to follow her lead. Did she want to take the tour at RISD? Did she want to look at Quinnipeac? Yale? After all, she’s the one who’s going to college, not me. It’s her life and she is wise and knows herself with amazing clarity. We spent the day exploring and just being together. I am so grateful. Grateful for my life, for her life. Grateful to be home safe and looking forward to the next road trip. I am grateful that you and yours are safe, too. My little ones are still in elementary school — I can hardly imagine when the time comes for them to move on to college….sounds like you are taking it in stride and had a fabulous mother/ daughter trip! I am not taking it in stride, but I am trying to support and love her. Parenting is an amazing adventure! Go to Boston, it is a great city. My son is a sophomore there and loving it. He is taking advantage all it offers. Good luck with your search. Can’t wait to reschedule our visit to Boston. Thanks for reading.